We’ve known Supergirl was coming to LEGO Dimensions since March and we even saw her show up in a parts list for the Playstation 4 Starter Pack. But it’s been a mystery how LEGO was planning on releasing this superhero. After she was absent from E3, ComicCon, etc., many feared she would indeed come packed in a new Starter Pack. Today, those suspicions were confirmed. 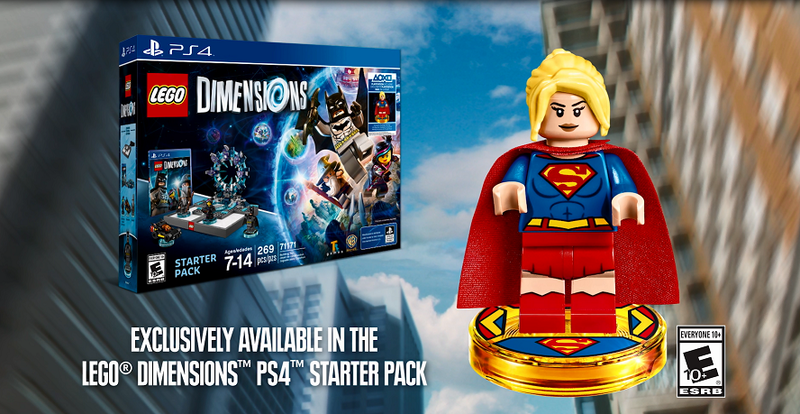 LEGO Dimensions will be releasing the Supergirl figure exclusively in a Playstation 4 Starter Pack on September 27th for a “limited time”. It is available for pre-order now for a price of $89.99. Though don’t fear yet, as the trailer mentions Super Girl is available in the PS4 Starter Pack “exclusively through 3/28/16“. So perhaps it will be available widely in a future wave. If you don’t want to buy another Starter Pack, but do want to play as Supergirl, she will be available in the “Hire-a-Hero” feature starting in 2017.